The facade of GAES headquarters in Barcelona is a risky proposal. In filt3rs.net we addressed the behavior of the green filtering elements; here is the time to comment the facade solution as a whole. GAES headquarters has an enclosure with a large surface exposed to the northeast and northwest orientations. 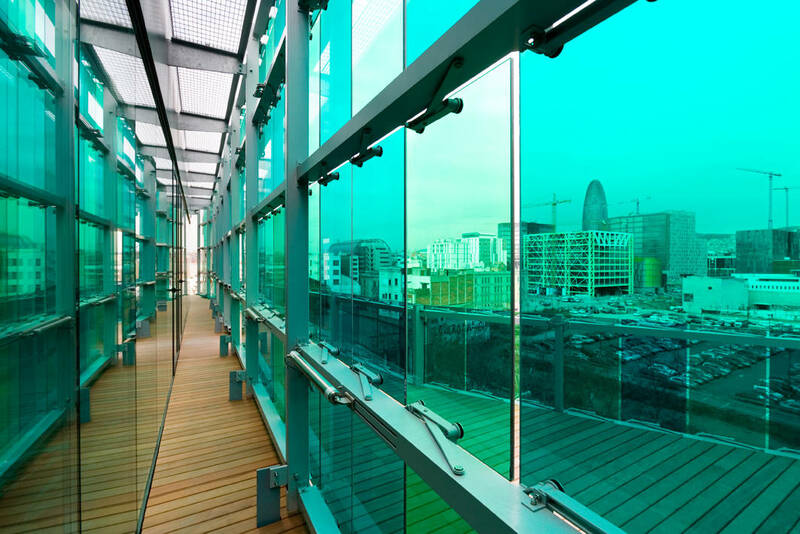 In this situation, the resort to glass for covering most of the façade surface entails assuming a quite high value for transmittance. No matter how good glass are, transmittance will be around 1 W/m²K. Considerable losses in orientations where gains are practically negligible. We do not know which the overall energetic balance of the building is: internal loads, contributions from passive sources other than solar, and so on. Remember that the building is on the 22 @ district in Barcelona and, therefore, very possibly is connected to the Districlima urban hot and cold network. We simply want here to draw attention on those solution that close with glass facades with low sun exposure in climates where loses can be considerable during winter solstice.